Dwarf palmetto Sabal minor with a dusting of snow, Congaree National Park, South Carolina. Hardy palms are any of the species of palm ( Arecaceae) that are able to withstand brief periods of colder temperatures and even occasional snowfall. A few palms are native to higher elevations of south Asia where true winter conditions occur, while a few others are native to the warmer parts of the temperate zone in North America. A few of these temperate climate palms can tolerate hard freezes with little or no damage. Many of these "hardy " species can be cultivated in warmer parts of temperate climates. The hardiest species are found in the genera Rhapidophyllum, Sabal, and Trachycarpus. Members of these and other genera are sometimes grown in areas where they are not truly hardy, overwintering with the aid of various kinds of artificial protection. 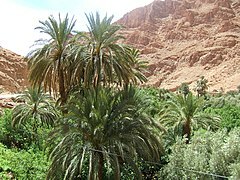 The minimum temperature a palm can sustain depends on a variety of factors, such as humidity, size and age of the palm, daytime high temperatures, or the length of time the temperature is at the minimum. A week of high temperatures below −6.6 °C (20.1 °F) will do far more damage to a palm than an overnight low of −13.9 °C (7.0 °F) for an hour or so. The fan palms ( Arecaceae tribe Corypheae; palms with fan-shaped leaves) include all of the hardiest palms. Windmill Palms ( Trachycarpus fortunei, T. takil) – is considered the most cold hardy palm in the world. These tough species are native to eastern China and the Himalaya mountains where severe (though brief) winter conditions occur. Hardy to about −23 °C (−10 °F), they grow at high altitudes where temperatures are cool. It is also tolerant of low summer temperatures. Mature Trachycarpus trees have been successfully grown as far north as 58°N in northern Scotland. Mature specimens can also be found in the southern coast of Ireland, the southern coast of England, southwestern Canada (in the city of Vancouver and on Vancouver Island), eastern Asia ( Japan, southeast China, South Korea), Southern Switzerland ( Ticino) and in parts of Australia and New Zealand. Bismarck Palm (Bismarckia nobilis) - Native to the island of Madagascar off the east coast of Africa this cold hardy palm is among the most sought after palms in Florida mainly due to its unique grey color and ability to withstand temperatures down to 15 f. This palm thrives in any sub-tropical environment. You will see this palm tree in states such as: Alabama, Arizona, Arkansas, California, Georgia, Louisiana, Mississippi, Nevada, Oregon and Texas. It is a very fast growing palm, and can go from 3 to 15 feet in just 5 years in the right environment. During late spring the tree will produce small, fragrant flowers. Once fully matured, it can reach heights of up to 70 feet in the wild, however most do not exceed 40 feet. This palm produces sharp thorns on the frond stalks, so one must take proper precautions while pruning. Mediterranean Fan Palm (Chamaerops humilis) – The only palm native to southern Europe besides the Cretan Date Palm, and very drought-tolerant. Hardy to −12 °C (10 °F), but does prefer hot summers. Despite the fact that this palm is less hardy than many palms listed here, it has the northernmost native habitat. It is found in abundance across most of southwestern Europe and northwestern Africa. It is a very slow-growing plant. The blue form of the species, native to high elevations of the Atlas Mountains, has recently been introduced into the trade and early reports indicate that it may be 5 °C (9 °F) or more degrees hardier than the green form. Needle Palm (Rhapidophyllum hystrix) – This clustering and usually trunkless palm is native to the subtropical southeastern United States, from central Florida to Georgia, Mississippi, South Carolina and Alabama in the United States. It is considered hardy to -23.3 C (-10 F), and is cultivated along the East Coast from Florida to southern Massachusetts, and along the West Coast from California to Seattle. They have proven hardy in the Tennessee valley region and up into the lower Ohio Valley. The needle palm is very slow-growing and rarely reaches heights of over 1 m (3 ft 3 in). There are documented specimens that have been growing in White County, Tennessee, since the early part of the 1960s, as well as United States National Arboretum in the Asia Valley section, in the city of Washington D.C., that are at 3 m (9.8 ft) in height. Mazari Palm (Nannorrhops richtiana) – This palm, native to the dry, mountainous terrains of northern Pakistan, Afghanistan, Iran and surrounding regions, is also thought to be extremely cold hardy (perhaps to about −20 °C or −4 °F), though also requiring hot summers and dry soils. However, due to its limited availability in cultivation, not much is known about this palm. Mazari Palm is not easy to grow, perfect drainage and full sun are required for this palm to survive. This palm will not tolerate wet freezes. Saw Palmetto (Serenoa repens) - These palms are native to the southeastern United States, most commonly along the Atlantic and Gulf Coastal plains, but also as far inland as southern Arkansas, this bushy palm is hardy to about −15 °C (5 °F). This bushy palm grows in abundance within wetlands and subtropical grasslands of central and northern Florida. Extract from Saw Palmetto is often used to treat problems with the prostate. Sabal palms (palmettos; 13 species) – These palms are native to the southeastern United States, Mexico, Central America, and the Caribbean. The Cabbage Palmetto (Sabal palmetto), the state tree of both Florida and South Carolina, and is widely cultivated along the south Atlantic coast of the United States. The species is considered hardy to USDA Hardiness Zone 8, and may survive short periods of temperatures as low as −14 °C (7 °F). The Mexican Palmetto (Sabal mexicana) is a close relative of the Cabbage Palmetto, native to southern Texas and northern Mexico. Dwarf Palmetto (S. minor) is considered hardy to USDA zone 6b, like the needle palm. It can tolerate short periods of temperatures as low as −22 °C (−8 °F). Endemic to the swamps and lowlands of the south Atlantic and Gulf of Mexico coast of the United States, it can stand long periods of heat and drought. Sabal minor is successfully cultivated across the entire southern United States below 35 latitude, and up the East Coast to 41 latitude and up the West Coast to 45 latitude. Caranday palm (Trithrinax campestris) is a South American arecaceae palm native of Uruguayan and northeastern Argentine sabanas. It is a very rustic palm that grows in arid, well drained, rocky soils. Its distinctive features are its compact shape, short green to grayish foliage, and trunk fully hidden by dry dead branches (coat) remaining from several previous seasons. It is very resistant to drought, and -9 °C/-15 °C temperatures when not in growing season, although it tends to shed its leaves in these conditions. It is one of the most cold-hardy palms in the world, because it also grows in the mountains of Sierras de Córdoba. Washingtonia palms ( Washingtonia filifera, W. robusta) – These palms are native to southern California and northwest Mexico, growing as high as 30 m (98 ft) in their native habitat. California Washingtonia (W. filifera) is hardy to −12 °C (10 °F); it prefers a dry Mediterranean climate, though it still grows in areas with humid subtropical climates like Brisbane, Sydney, Houston, and New Orleans. It is sometimes grown in containers, or planted as short-term specimens in areas where it is not quite hardy. Mexican Washingtonia (W. robusta) is somewhat less hardy, native to northern Mexico (Baja California Peninsula). It has a more robust trunk and stiffer leaves than W. filifera, and is hardy to −10 °C (14 °F). Livistona australis – It is native to southeastern Australia. Rhapis excelsa – It is native to China and it is hardy to about −7 °C (19 °F). Few palms with pinnate leaves tolerate much frost. They belong to several tribes of the Arecaceae, with the species listed here belonging to Tribe Areceae ( Chamaedorea), Tribe Cocoseae (Butia, Jubaea) and Tribe Phoeniceae (Phoenix). Chilean Wine Palm (Jubaea chilensis) – A contender for the hardiest pinnate-leaved palm, it is hardy to about −12 °C (10 °F) and has been cultivated successfully as far north as Seattle, Washington, Vancouver, British Columbia, and London England. This palm does not perform well in hot, humid climates. Canary Island Date Palm (Phoenix canariensis) – This species is hardy to about −10 °C (14 °F), and is grown as far north as the south of England (50°N), producing viable seed (in Southsea, Hampshire). In North America mature specimens can be found as far north as Gold Beach, Oregon (42.5º N) on the West Coast, and Myrtle Beach, South Carolina (34.1 N) on the East Coast. This palm is one of the most commonly grown palms in the world. Well adapted to low humidity and little watering, this palm is used as an ornamental in both Mediterranean climates and desert climates. In more humid climates, these trees will often be seen with sword ferns sprouting just beneath the crown. Ceroxylon quindiuense – It is native to the Colombian Andes where it is found at 2,500–2,800 m (8,200–9,200 ft) above sea level. At this altitude it tolerates occasional frosts for short periods of time. Archontophoenix cunninghamiana – It is native to Australia. Howea forsteriana – It is native to Lord Howe Island in Australia. Rhopalostylis sapida – It is native to New Zealand. It is southernmost palm in the world found as far south as 44°S. Caryota species – They are generally considered tolerant to occasional frosts. Some plants used in subtropical landscaping in temperate climates like much of Europe, northern China/Japan, Korea, the northern USA, New Zealand, etc. that are commonly referred to as "palms", but are not palms, i.e. not members of the Arecaceae family, include: yuccas, Aloidendron barberae, Cordyline australis, Cordyline indivisa, Cycas revoluta, Macrozamia communis, Macrozamia johnsonii, Macrozamia riedlei, Cyathea australis, Cyathea capensis, Cyathea cooperi, Cyathea dealbata, Cyathea medullaris, Dicksonia antarctica, Dicksonia squarrosa, Pseudopanax ferox, and occasionally the sumac Rhus typhina. ^ a b Soares, Kelen Pureza (2015). "Le genre Butia". Principes (in French). 1: 12–57. Retrieved 17 September 2018. Højgaard, A., Jóhansen, J., & Ødum, S. (1989). A century of tree planting on the Faroe Islands. Ann. Soc. Sci. Faeroensis Supplementum 14.